to rest,' 'putting the garden to bed' and other allusions to 'sleep' and restoration. It is not true for in the Mediterranean Climate! We are in our other Spring and this Spring is really closer to the Spring that other parts of the world experience. This is our shot at carrots, peas, and other cool season plants. We either have all our space filled with plants, or we've just got a part planted and big plans (dreams) for the rest. So the Winter garden is in full swing. Later this month, if I have grown any green manure cover crops I will cut them down, leaving the plant material in place and cover with a thick layer of mulch. I would like to allow this to “mellow” (meaning I want this material to begin breaking down into nutrients the plants can use) for about 2 weeks or more before placing the next crop in. Another way to do the same thing, for a larger family, is to plant three different things per week – carrots, beets and spinach in week one; turnips, lettuce and parsnips in week two; carrots, beets and parsnips in week three. Or spinach planted in one row every week all cool season long. Tailor the program to your needs! You might also find that you need longer rows – I wouldn't imagine that an 18” row would suffice for a family of four! Play around with the scheduling and the row length and the mix of plants you grow until you find what your family needs. At which point, of course,their needs will change, but you'll have a lot more data with which to figure out the new schedule. In our smaller gardens there is no room for the proverbial 50' row of carrots which means succession planting of a given vegetable is one of the staple strategies for your daily grub. Another good point about putting in many smaller plantings of crops is the ability to harvest these vegetables at a smaller size, which is just the ticket for a garden in containers. Don’t get suckered into the “bigger is better” routine. A huge cauliflower might serve as a great subject in a “look what I grew” photo contest, but the cauliflower you pick at half the size will be the one your tastebuds will reverently remember. A mark of the very good gardener is one who has his/her succession sowing down to such a science that allows them to place fresh vegetables on the table without lag time or a concentration of over-abundance that fluctuate to nothing to eat for a few weeks in between. Learning how to do this well has been the work of a lifetime for many and is still a moving target. But at least I know what I’m shooting for... and now you do too. Direct sowing of seeds gets far too much mystical billing. It’s easy. The hard part, in our busy world, is staying disciplined enough to keep them moist. Remember, the seed wants desperately to grow, that is its “job.” If you provide enough water for the seed to break the seed coat, you will soon see a little pair of leaves above the soil. These are called cotyledons and, if there are two of them, you have what is commonly referred to as a 'dicot' (“di” meaning two), horticultural shortcut word for dicotyledon. There is only one other kind of flowering plant we would be concerned with in a vegetable garden and that has only a single seed leaf and is called a 'monocot' (one-leaf). Monocots, meaning 'monocotyledon,' are all the grasses, which includes grains like corn, wheat, rice and barley. And a lot of your weeds! Take note of all the little cotyledons of the plants you grow and soon you will be able to tell them from the weeds. This is somewhat important. If you can rid yourself of weeds before they get really big, you have a much easier job of it; if you rid yourself of all the wrong plants because you mistook the lettuce for dandelions, you'll be a very disappointed and frustrated gardener! I have done this, I am not too proud to say. Learn them quickly to forestall the sadness of hoeing up your own plants. Composting is one of the more essential parts of gardening. Gardening is a life cycle and composting is that part of the cycle that returns nutrients and fertility to the soil. In our culture, we don't like the smell or the thought of decomposition, yet a knowing gardener loves the smell of rich compost; that ever so slightly 'sweet' smell, incidentally, is from actinomycetes, a fungus that is in the same group of organisms as penicillin. You can get absolutely nuts trying to build a scientific compost pile, but let me offer that I don't do all that. Decomposition happens. Simply leave some veggies in your fridge too long and tell me they did not begin to decompose. And you didn't have even think about carbon to nitrogen rations (c:n). You do want to understand the process – especially if you don't have the space to leave something sit for 9 months, which is what I tend to do – to get usable compost in less time than it takes to grow a decent cabbage. Remember you have 'browns' and 'greens,' names that are somewhat misleading. 'Browns' refers to carbon material which is mostly, or usually, brown. This is dried leaves or woody pieces. 'Greens' are those materials full of nitrogen – usually represented by grass clippings, but all of your table scraps are nitrogen sources too and they too are classed as 'greens' regardless of their color. While we can specify the ideal carbon to nitrogen ratio, achieving it is always a meandering attempt to meet a moving and approximate target. Believe me, you'll never have composting materials in the right amounts to achieve an ideal c:n ratio, which is considered to be 25-30 parts per brown to 1 part of green. So, add all the green you have and scrounge around to dig up enough brown to make it work. You can add newsprint or cardboard to the pile to bring up the carbon level ('brown') if you have those around, Mix well and water – keep moist. Make a pile that is at least three feet high by three feet long by three feet wide; this is the minimum size to create a working compost pile. Keep moist. Turn the parts that are inside outside and the parts that are outside inside. Keep moist. Not soggy, but moist. In about 9 weeks of warm weather, you'll be able to use fresh compost. Sift out the big honking pieces and return them to the pile (they will help get the next pile off to a better start) and build it again. Honestly? I usually dig a trench about one foot across and two feet deep and as long as it needs to be to handle what I have to compost. I pick a part of the garden I won't use for a few months and add the compostable materials, covering with soil as I go. I add to the trench each day I have more to compost. Eventually I'll simply plant right into that soil, starting in the oldest part of the compost ditch. No big deal and it works without a lot of reading. Or thinking. I did this when I had a small garden and kept working compost into the soil in this pattern. On the Plus side, it's not a rodent attractor and it's no muss, no fuss. It's perfect for a single or two person household that doesn't produce a lot of compost. It would also work as an overflow method for folks using worm bins as their # 1 composting method. You can find the composting technique that thrills you. The important point is that none of these rich materials, food or garden waste, ends up in a land fill. All of the plant wastes from the kitchen and table are the best components for a rich garden and they are free! The benefits of composting for your garden and keeping valuable material out of the landfill are a double whammy of 'why this is important!' You don’t need to worry about doing it perfectly... everything rots eventually. If you are building a compost pile, you don't need to buy a black plastic container or any other kind of device. The black plastic composters were probably designed back east and made black to absorb more heat; we don't need it here, having plenty of heat (usually) to go around. A simple thee feet by three feet by three feet pile will do. One thing to be careful about is to keep your kitchen scraps covered with some 'carbon' kind of material or you may attract rodents. Just the simple precaution of burying food scraps under a decent layer of dried leaves will help prevent a mouse problem. A smelly compost pile has too much water. Hold off watering for a few days, work in some dry carbon material without more wet and soon it'll be OK.
Rodale's book on composting is listed in the notes section. Get it, it's a great resource. For apartment dwellers, condo owners and others with no easy access to land, vermicomposting is the answer you are looking for! And you didn't even know you had the question! It's easy, the result can be used on plants in pots and your garbage need never grace the entrance of a landfill ever again! Most home stores sell two storage bins that work very well for vermicomposting. The smaller bin is a 10 gallon container by Rubbermaid called Roughneck Storage Bin #2214-08. It’s dimensions are 9” x 21” x 15” , comes with a lid and is available in various colors. This size works well for a family of two. In planting seeds, please note that root crops are never planted in containers to be transplanted later. There is a really good reason for this: they do NOT transplant well. Onions, and onion family members are the exception. Carrots and parsnips abhor being transplanted and beets and turnips suffer so much shock it is not worth the trouble. While I often start lettuce in six packs in a sheltered location, it can sown in the soil directly as well. I like to do both, when a plant will let me do both because they each have advantages and drawbacks. Plants that are transplanted will suffer some shock in the transplant and that will slow them down a bit. However, plants grown directly in the garden are often subjected to harsher conditions that can overwhelm a small plant; a hard rain, pests that consume the whole plant while it's small. If you can, start plants both ways to maximize your chance a good harvest. 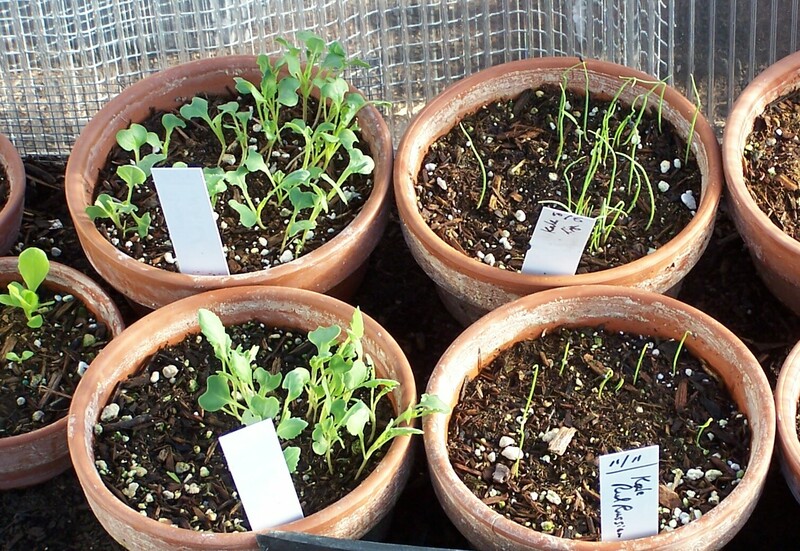 Fava beans, garbanzo beans, lentils and peas can also be grown either in containers or directly sown. Slower growing small plants, though, really do benefit from growing in a sheltered location. In this group, I put broccoli, kale, cabbage, cauliflower and Brussels sprouts. These are also plants that one should set in the ground lower than they were in the original container, so transplanting them makes great sense. This is a busy month – and the more you do early, the happier you will be! As the month rolls along, sunset gets earlier towards an unreasonable hour and you'll regret the missing outdoor light. More of the cabbage family! Heat the oven to 425°F. Halve the squash, leaving the skin on, and scoop out the seeds, then cut into 1-inch cubes; you don't need to be precise, just keep the pieces uniformly bite sized or so. Throw into the oven or, in warm Southern California weather, on a grill until tender. Toss the hot squash into a bowl and scatter the pecans throughout, crumbling the cheese over all and toss together. This can be a wonderful side or you can get more involved and create a main course dish from it.